The Nicols Sixto Prestige C is a very comfortable boat which can be sailed without a license. It is perfect for 2 couples or for 1 couple with 2 children. Make a cruise and become the captain! Interior equipment: - Indoor + outdoor steering positions. - 2 outdoor deck areas. - TVs on board, air condition, microwave and dishwasher. - Saloon : 11 m². - Kitchen equipment :195 L Fridge - freezer, dishwasher, microwave, 4 ring-hob oven. 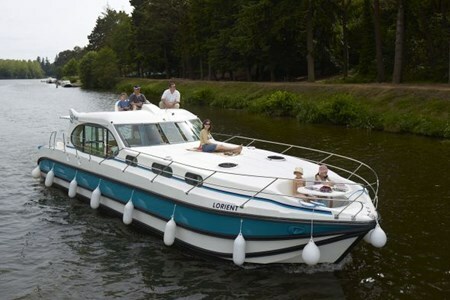 - Water tank capacity : 1150 L.
- Fuel tank autonomy : 14 days / 270 L.
- Other equipments : Air condition, shower and bathing ladder, Radio CD,2 TV / DVD(saloon + cabin "suite" TV 80 cm), electrical connector 220V in bord, Stem propeller and garden furniture. - 2 very spacious cabins. - Double beds (140 x 190 cm) : 2 + 1 saloon. - Single bed (70 x 190 cm) : 2 possible.